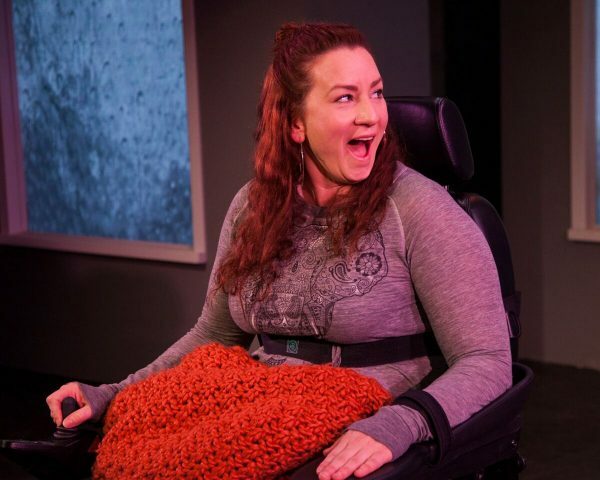 With a title like Martyna Majok’s Cost of Living, you can pretty much tell that the play that just opened at The Fountain Theatre is going to be about that living’s high cost. Less predictable is just how high that cost can be — or might go — for some people. And although money plays a role in any life, and does here too, it is at once a present yet marginal element in the overall context of Majok’s preoccupations. 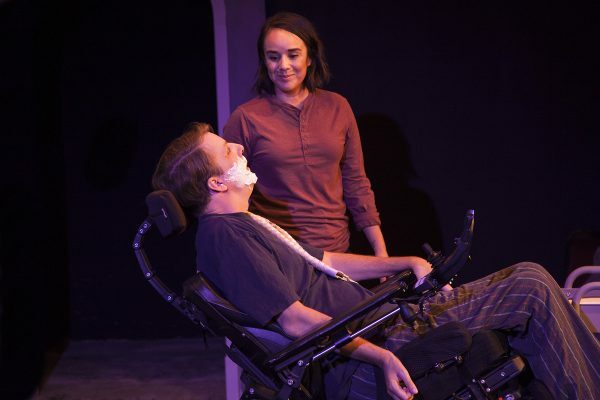 Given the Fountain’s dedication to doing plays of “diversity and inclusion,” its previous and current production have expanded the term to now extend to productions that feature actors with disabilities performing on stage. Cost of Living is a stunning example of the kind of magic four good actors, able or disabled, can achieve when they’re handed a good director and a remarkable piece of writing. The director is John Vreeke, who mostly has been active with Washington DC area theatres and Woolly Mammoth in particular. He handles Majok’s emotionally loaded piece with the tenderness, humor and care it cries out for. 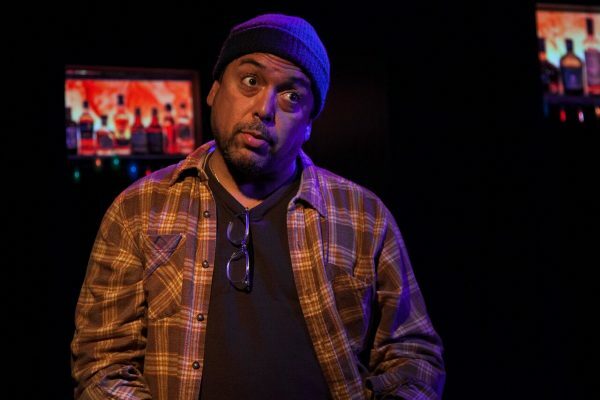 Felix Solis in Cost of Living at The Fountain Theatre. Eddie (Felix Solis) is a currently unemployed trucker who seems to have carelessly misplaced his wife, Ani (Katy Sullivan). Yeah, it’s true that they were sorta separated, but now that he can’t find her and thinks she died, he misses her. He’s that kind of guy, you know? Well-meaning, but a little distracted. When he suddenly finds her — I won’t tell you how — it seems she was in an accident that severed her spine. 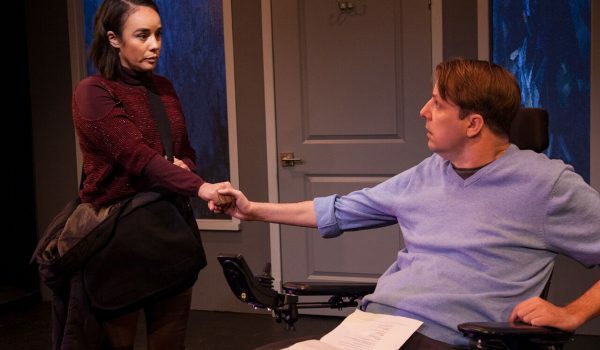 In another part of town, a tough and very private young woman named Jess (Xochitl Romero) who attended Princeton yet mostly works in “late bars,” is applying for a job as caregiver for scholarly John (Tobias Forrest), wheelchair-bound by cerebral palsy. John possesses an ego and a healthy trust fund that he lets her know is large enough to satisfy all his needs. All but the need of a healthier body. 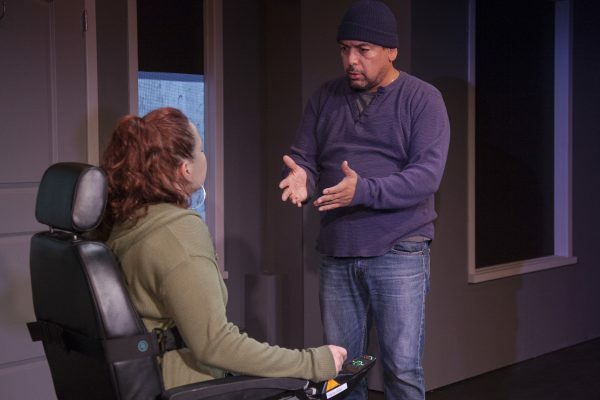 Tobias Forrest & Xochitl Romero in Cost of Living at The Fountain Theatre. These two couples don’t know one another and would be unlikely to meet, but events overtake them that change their immediate lives and make them collide in mysterious ways. When Eddie finally finds Ani, she’s pissed; pissed at him, pissed at the rotten hand life has dealt her, pissed that Eddie screwed up his trucking job, pissed that he wants to become her caregiver — because, knowing him, she figures he’ll screw that up too. But Eddie begs, Eddie pleads, Eddie-the-bungler is so maddening and forgivable in his bungling way that he’s difficult to resist. He tells Ani he misses her, he’s lonely, and, hey, who’d be better at taking care of her than an ex-husband who also, you know, needs a job? 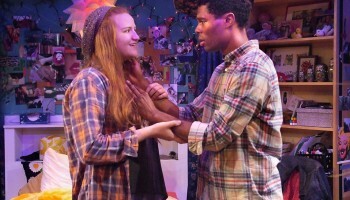 Katy Sullivan in Cost of Living at The Fountain Theatre. With John and Jess, it’s a different story. He’s the boss; she’s the proud yet recalcitrant person in need that John also happens to need. John may have cerebral palsy with all the pain that implies, but Jess’s need may be greater. It’s the need of family, of a friend, of enough money to eat and pay rent, and above all, it’s the need of somebody’s warm arms around cold shoulders and a wilting heart. We recognize all of these people, and Majok acknowledges in a program note that her “characters are all composites of people I have known or have been…” Have been. Heavy stuff. It shows. In very good ways. Cost of Living is an unsentimental play about difficult and complex emotions, as recognizable as your face in the mirror. We’ve probably all felt them in some form at one time or another, and Majok captures them like fireflies in a jar. What’s outstanding about her brand of eloquence is that it conveys all this with very few words, most of them not altogether coherent, except that what’s unsaid comes through in a confusion of funny and loud and clear. She makes us see the beauty and the longing of these people in their inability to articulate. That rubs very close to the bone. No wonder Cost of Living won so many major accolades, including the Pulitzer Prize. 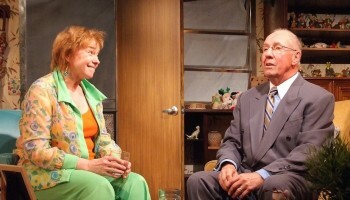 Katy Sullivan & Felix Solis in Cost of Living at The Fountain Theatre. 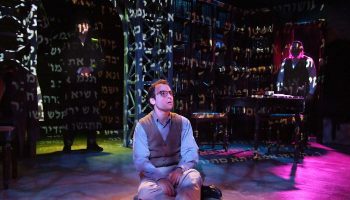 Vreeke’s staging is as unadorned and direct as Tom Buderwitz’s bare apartment setting, delivered with uncomplicated lighting by John A. Garofalo and clear sound by Jeff Polunas. That’s all that’s required. No bells and whistles. Just honesty and truth. The terrific surprise is the cast. Solis delivers an outstanding Eddie, lost in his grief, in his ignorance, his bluster, his kindness and pain. Sullivan’s Ani is equally admirable in her hysterical anguish at seeing her life destroyed by a split-second event that has shattered all hope of independence or joy. Her feelings for Eddie are a contradictory stew of despair, fury and hope. As different and crazy as they are, these two people love each other. Romero’s Jess is the opposite, enigmatic and stoic, perhaps because she may be closest to mirroring some of the playwright’s personal experience. Forrest’s imperious John reveals himself the least, because he doesn’t need to. He has the armature of money to shield him from whatever other disaster life might dish up. Things do not magically redress themselves for either couple. Indeed, things get quite a bit worse before offering a glimmer of something that looks distantly related to hope. The play stays with us because it reminds us of how breakable we all are, as well as how strong we can be when we must. Spending an hour and 45 minutes with four individuals so walled off that they can barely express themselves, and yet who can make us feel it in ways words never could, is some kind of memorable. Top image: Xochitl Romero and Tobias Forrest in Cost of Living at The Fountain Theatre. Photos by Geoffrey Wade Photography. 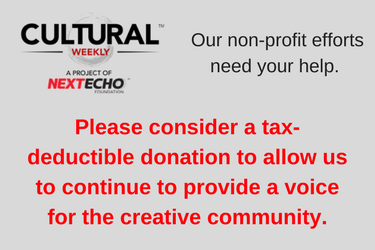 WHERE: The Fountain Theatre, 5060 Fountain Ave. (at Normandie), Los Angeles, CA 90029. 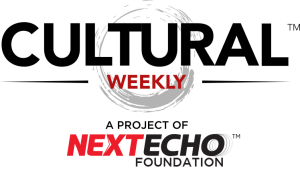 WHEN: Fridays, 8pm; Saturdays, 2 & 8pm; Sundays, 2pm; Mondays, 8pm. Ends Dec. 16. 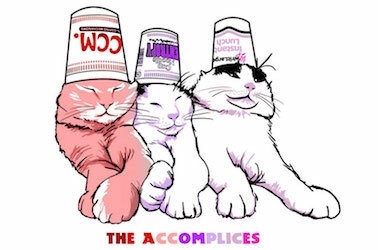 HOW: Tickets $25-$45, online at www.FountainTheatre.com or by phone at 332.663.1525. Seniors, $35. Students with valid ID, $25. Monday nights, $40 or pay-what-you-can (subject to availability). PARKING: $5 or on the street.